15 miles on the mt rd & Big Block. 60*, lite winds, 30% humidity. 7 mile Tempo Trainer: Mile 1: warm up, 2. 9:36, 3. 9:16, 4. 8:09, 5. 8:03, 6. 9:09, 7: cool down. 13 days till pay-day! Todays run was one of my best functional runs of the training cycle, all my parts were working in unison and as they are intended to work.....now if I can replicate this on Race day at Boston I will be a very happy old guy running!!!! 5 mile easy run on the big block today. 6.5 mi on th Porter Rockwell Trail today. 48*, 78% humidity in the form of a light rainfall, 6 mph wind . Technically this is the last day of my second week of taper and the beginning of my last week of taper....10 days till Boston! Rest Day, went to the gun show at the expo. 12 miles on the Mt Rd this fine windy, rainy, cloudy day. 6 mi on the PRT, really nice running weather hopefully kinda like what it will be like in Boston on Patriots Day, on Monday, at the Boston Marathon for my 13th Time, Yea! 3 mi on the elliptical @ 180 strides per min.....too much rain outside . Each year's Boston Marathon Marathon is memorable in its own right, and the 2018 edition will be remembered by me from my first steps in training through crossing the finish line on Boylston Street. I will remember this Boston Marathon as the one with the worst combination of foul weather I've encountered while participating in the Boston Marathon since my first run as a participant in 2000. From the moment I arrived at the Athletes Village in Hopkinton prior to the start of the Marathon I had announced to others and myself that I would be making the decision on how I would run the Boston there in the atheletes village based on the conditions that were present. At the athletes village when I arrived the conditions that were present and projected to be continuing through the race were heavy winds out of the NE with gusts up to 60 mph. Very cold temperatures and Noreaster type heavy rain. I found myself putting on a rain poncho before getting off the bus because of the poor weather conditions and not wanting to be soaked to the bone before the race even started. While huddled under the huge circus like tents with thousands of other wet, cold runners that were dismayed with the weather conditions standing in a field of mud and standing water trying to keep our running clothing and shoes from getting wet and our bodies from getting cold before the race. I made my decision that I would run this race but only to finish. I had stated earlier that I have a "BQ" for the Boston Marathon 2019 race so I would run this Boston Marathon to finish, and finish it without getting sick or injured. It was raining so hard and the wind was blowing everything around me so hard that it blew out the announcing system in the tint I was sheltering in before the race so much so that I missed my call to my starting wave and corral and started with a whole bunch of runners at the tail end of the fourth wave. Even starting at the back of the pack and sticking with my race plan I still managed to pass about 6000 runners on my journey thru the vicious winds, the roads running like rivers and the freezing temperatures. From the beginning of my race until I finished the rain continue to fall, the wind blew like it was going out of style and the temperatures dipped below freezing. My thoughts during my run to the finish line were to finish this marathon as soon as I could and in the best condition I possibly could and then find my way to my room to get dry and warm. I continued to wear a rain poncho for 26 miles of the race only dumping it about the time I was running from Beacon street to Hereford. On Hereford street there were so many ponchos, rain coats and garbage bags thrown on the ground that it was dangerous to pass on to Boylston street to the finish line. I finished the race in a little over an hour longer than I had planned on running this Boston with a 4 hour 31 minute & 54 second. 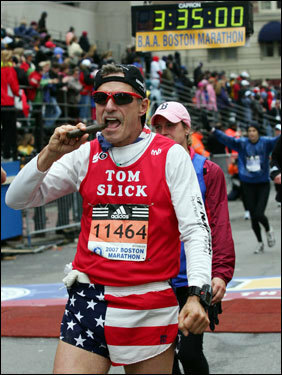 So with all that in mind, I am excited and can hardly wait till I can return to the 123rd running of the Boston Marathon in 2019. This is the Greatest and Longest running Marathon in the United States of America and I hope to be a part of it as long as I can will my short, fat, old man body down the road to the finish line!!!!!!! One last thought, I would like to thank the thousands and thousands of people that lined the streets from Hopkinton to Boston and cheered on the runners to finish this race! 3.62 miles today for my first outing since the Boston death march. After the run I put in a light workout at the gym. Tomorrow I will post my Boston experience! 4 miles on the big block this morning. 5 months-13 days-16 hours till the St George Marathon! 1 mile warm-up run & a full body W/O. My recovery is coming along great. 5 miles on the Big Block at a moderate pace. 66*, 10 mph wind, etc. 3 miles on the Small Block, 55*, 2 mph breeze, humidity 46%.....then a W/O at the gym.